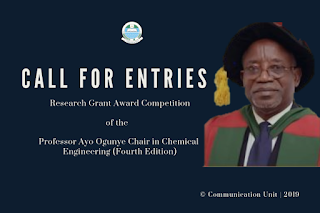 Call for Entries: Apply for the Research Grant Award Competition of the Professor Ayo Ogunye Chair in Chemical Engineering (Fourth Edition) 2019/2020 Edition. 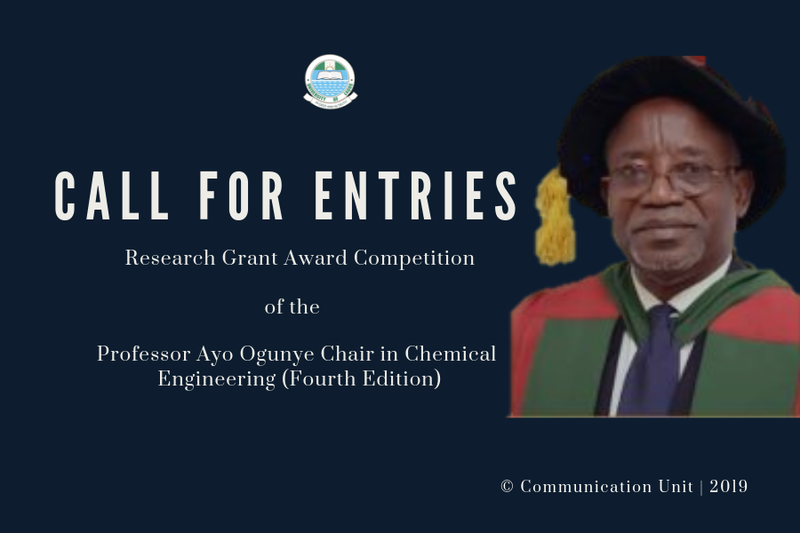 The Board of Trustees of the Professor Ayo Ogunye Professorial Chair in Chemical Engineering, University of Lagos, is calling for entries from Monday, March 18 to Monday, June 17, 2019 ahead of the Fourth Edition of the Research Grant Competition. The Board of Trustees of the Professor Ayo Ogunye Professorial Chair in Chemical Engineering, awards a limited number of grants yearly to a maximum of N1,500,000.00. The Trustees main research interest will vary from year to year and this will be made known during the call for the competition. i. The nature of the research which he/she desires to engage in and the nature of the scientific results expected to follow there from. ii. Where the research is to be carried out. iii. The approximate full cost of the research and a breakdown of the proposed spending (expenditure) should the grant be awarded. This should include quantities and approximate costs for each item. iv. What other sources of financial assistance are available to the applicant for research; whether these are available in this instance and to what value. RECOMMENDED: 2019 Omololu-Mulele Research Grant Award Competition Guide [₦3M Grant].